Sinewave Filters smooth a sinewave without voltage peaks. They also provide protection for the variable speed drive and allow the use of unshielded motor cables, resulting in lower project costs. Our friendly team of highly trained specialists will quickly assist you. Reduce motor heating through reduction of high frequencies associated with VSD output and also reduce motor insulation stress through reduction of motor peak voltages. Reduce audible noise through reducing high frequencies associated with VSD output. Reduce emissions through reducing high frequencies associated with VSD output. 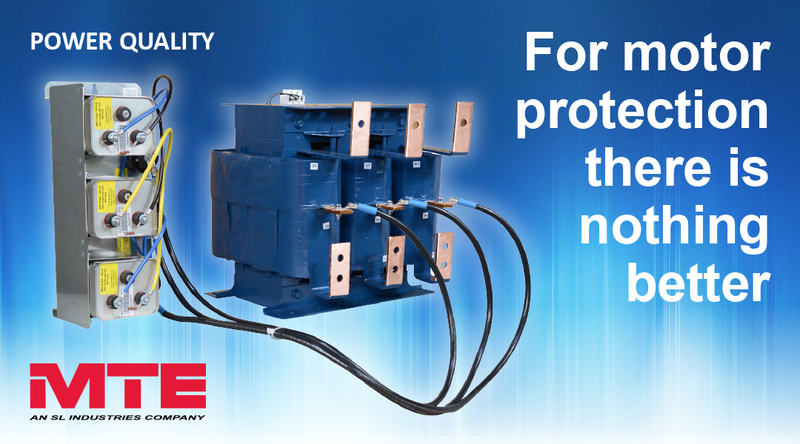 The reduction of high frequencies associated with VSD output eliminates the need for special motor cables. Sinewave Filters smooth a sinewave without voltage peaks. They also provide protection for the variable speed drive and allow the use of unshielded motor cables thus resulting in lower project costs. Motor operating life is increased, longer motor cables are possible and motor noise, vibration & heat are significantly reduced. The MTE SineWave Guardian Filter is a best-in-class filter that delivers unequalled performance in cleaning the PWM waveforms generated by Variable Speed Drives (VSDs). It virtually eliminates high frequency content and voltage peaks, thereby reducing motor heating to give you extended motor life – and less downtime. The SineWave Guardian also offers incredible reliability and durability. It is more efficient and tolerates higher ambient temperatures, making it ideal for a variety of applications from steel mills to oil fields. Its modular design and smaller footprint make it easier to integrate and install. It all adds up to the best SineWave Filter, and the best value on the market today. SineWave Guardian Filters transform the output of Variable Speed Drives (VSDs) to a near perfect sinusoidal waveform for the best level of motor protection. MTE’s unique, patent-pending design offers high performance with smaller size and better efficiency than traditional LC Filters. Located in remote central Queensland, the Wallumbilla Gas Hub is a major part of the Australian natural gas infrastructure network. The function of this facility is to compress the natural gas that is extracted from the ground in that area and pipe it to Brisbane and Rockhampton. Or you will receive $100 off your next purchase. Read how it works. Fuseco offer solutions for compliance to IEEE519, protection of motors & drives and cost savings achieved through operational efficiencies. The management of heating, ventilation and air conditioning incorporates pumps, motors and VSD’s, resulting in the propagation of harmonics. Fuseco can assist with resolving existing or avoiding future power quality problems, harmonic mitigation and compliance to IEEE519. Fuseco can assist with compliance to the harmonic standards, global OEM pricing and significant operational cost reductions. Consulting Electrical Engineers ensure that project specifications achieve compliance to IEEE519 & AS/NZS 61000.3.6. Of further interest are the cost & space savings achievable with the latest technology harmonic mitigation solutions. Achieving cost-effective compliance to the harmonic standards is quick and easy by installing the latest generation solutions. In simple terms, harmonics are extra frequencies that when present in an electrical circuit, distort the AC sine wave. A harmonic of a wave is a component frequency of the signal that is an integer multiple of the fundamental frequency. For example, if the fundamental frequency is f, the harmonics have frequencies 2f, 3f, 4f... etc. Harmonic frequencies are equally spaced by the width of the fundamental frequency and can be found by repeatedly adding that frequency. In the case of the Australian electricity supply, the fundamental frequency is 50Hz. The frequencies of the harmonics are 100Hz, 150Hz, 200Hz, 250Hz, 300Hz, 350Hz and so on. It must have a continuity of service (not be interrupted). It must have a very low Harmonic content. It must have a very low variation in the voltage magnitude. It must have very low transient voltages and currents. The term 'clean power' is used to describe electricity that is considered to be of good quality (see above) with particular reference to a very low harmonic content. Therefore, the term 'dirty power' is used to describe electricity that is considered to be of low quality (opposite to the above) with particular reference to a very high harmonic content. In Australia, our electricity is supplied in alternating current at a frequency of 50Hz. In alternating current (AC) the movement of electric charge periodically reverses direction. In direct current (DC), the flow of electric charge is only in one direction. 50Hz means that the AC has a frequency of 50 cycles per second. This is also known as the 'fundamental' frequency. AC is the form in which electricity is delivered to businesses and residences. Most electrical devices (such as motors) need clean electricity to function properly. This means that the electrical supply needs to be a clear sinusoidal wave. How do you know if you have harmonics in your electrical system? If you occasionally experience some unexplained occurrences such as flickering lights, alarms going off, or MCB's, MCCB's, RCD's and Earth Leakage devices tripping for no apparent reason, you are most likely experiencing harmonics in your electrical environment. Other signs are cables running hot, hot switchboards or overheating motors. If you are replacing your motor's bearings & insulation often, that's a strong indication of the presence of harmonics. What are the effects of harmonics in your electrical system? Harmonics are very harmful within an electrical system and can have serious consequences. For example, the presence of harmonics reduces the life of equipment. It is possible that the investment that you made in your motors & drives will not be realised if they are damaged and need replacing before their expected life span. This can be very expensive. Harmonics cause things to run hot, which cause stress on the cables and equipment. In the long term, this degrades an electrical system. The presence of harmonics will also mean that although you will get billed for the power that you are supplied, a large percentage of that power may be unusable. Harmonic mitigation is taking action to minimise the presence of harmonics in your electrical system and can achieve great cost savings. Variable Speed Drives (also known as Variable Frequency Drives) are prolific creators of harmonics in electrical systems and as a result, most of the harmonic mitigation effort focuses on the input side and output side of a VFD. What are the different types of harmonic mitigation devices? Line Reactors Simple & cost-effective method to reduce harmonics. Available in 3% & 5% versions. Passive Harmonic Filters Significantly reduces harmonics from the VSD back out to the system and also improves true power factor. Active Harmonic Filters Active filters inject a 180 degree inverse current to nullify the harmonic content going back out to the system. They mitigate harmonics, compensate for voltage dips & can handle multiple VSD's relative to the reactive power required. Meets the IEEE519 Standard. Load Reactors Simple & cost-effective method to reduce harmonics. Available in 3% & 5% versions. dV/dT Filters dV/dT filters have been designed to limit peak voltage and increase voltage rise time. In addition to mitigating harmonics, the dV/dT filter also clips voltage spikes. Sinewave Filters The ultimate load side harmonic mitigation product. Filters all harmonics, including reflective currents, eddy currents, common mode currents. Can be used for long cable runs (many kms). Stops the heating of cables. Great for the longevity of motors. From the moment the AHF and SVG units were turned on our power factor issues were a thing of the past. At both sites our PF is now 0.99 on all phases all the time, the units react instantaneously to our fluctuating load and power factor and the result has been an excellent return on investment.